Microsoft went all-in on Windows 10 devices today, unleashing a torrent of premium computing products in various sizes and form factors. Arguably, the Surface Book, Microsoft's first ultrabook-tablet hybrid, came in most unexpected. Yes, Microsoft finally made an actual computer of its own, which is a moment in history that some of you may have been waiting for decades! Let's get the lowdown on this powerful and impressive Windows 10 device. If you like how the Surface Pro 4 looks, but aren't interested in a tablet for some reason, you might just love the Surface Book. The hybrid laptop is built out of aluminum and very much resembles the MacBook Pro's iconic design, only there is a hinge on this laptop that you've never seen anywhere — not even on borderline alien-looking devices, such as Lenovo's Yoga line. The "Dynamic Fulcrum" hinge allows for the laptop's screen to be fully detached from the body (by pressing a dedicated button), but you won't be able to rely on the discrete NVIDIA GPU in this mode of operation. Still, this design is quite innovative! In addition to its detachment superpowers, the Surface Book features a glass-covered trackpad with five-point multitouch. There are two USB 3.0 ports, Mini DisplayPort, an SD card reader, and SurfaceConnect ports available as well. Dimensions-wise, the Surface Book measures 12.30” x 9.14” x 0.51 - 0.90” (312.3mm x 232.1mm x 13.0 - 22.8mm) and weighs at least 3.34 pounds (1,516 grams) including the keyboard. The more expensive models are presumably heavier. 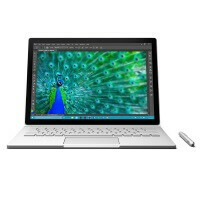 The Surface Book has a 13.5-inch display with a pixel density of 267 pixels per inch, achieved with an extra-high 3000 x 2000 resolution. The display is touch-sensitive and is able to work with the Surface Pen, which can, once again, be docked to the top of the screen via magnetic connection. Touting it "the fastest 13-inch laptop anywhere on the planet", Microsoft packed a lot of powerful internals in the Surface Book to be able to afford this claim. The computer is powered by Intel's 6th-gen Core series Skylake processors and runs with the chipset's integrated HD Graphics 520 GPU, or the discrete Nvidia GeForce GPU. Memory-wise, the laptop comes with up to 1TB of SSD storage and up to 16GB of RAM. There's also a built-in TRM chip for enterprise security uses. Battery life on the Surface Book is rated at 12 hours. Additionally, this powerhouse has a 5MP front-facing camera, an 8MP rear cam, two microphones and front-facing stereo speakers with Dolby audio. There are also a bunch of sensors - ambient light, accelerometer, gyroscope, and magnetometer. The Surface Book starts at $1,499 for the base model (Core i5, no NVIDIA GPU, 8GB RAM, 128GB SSD), while the most expensive model goes for $2700 and includes a Core i7 chip, 16GB RAM, and a 512GB SSD. The Surface Book will start shipping on October 26. The only option with 16GB, albeit Core i7 with Iris Pro graphics and an Nvidia GPU, is $2700. I was rally hoping it would be cheaper. I really hope they do. I've been waiting to upgrade my Surface Pro 3 and expected this announcement 6 months ago. It is worth the wait, but now I have more to choose from than I expected. Considering selling my laptop (Lenovo Y70 Touch - i7, 16GB, 500GB SSD, nVidia 860m w/4G, etc), and my Surface Pro 3 (Core i7, 8GB, 256GB SSD) and seeing if I get enough to make the Surface Book 16GB only $1000 more than I get for them. The Surface Book starts at $1,499 for the base model (no NVIDIA GPU, 8GB RAM) and will start shipping on October 26. This went from MacBook Killer to meh. The biggest highlight was the NVIDIA GPU but at $1,500 I can get a MacBook Pro with slightly better specs (albeit no touch screen and thus no 2-in-1). Yes I understand that the convertible aspect of it makes it so astounding but the lack of the NIVIDIA GPU gets rid of a major separator between the two products. http://mashable.com/2015/10/06/surface-book-vs-macbook-pro/#EeEMjnAesuqb there you go. macbook pro killer. obviously. Hilarious. We have an isheep writing a product off because of price. Lol that's hilarious. So everyone who doesn't share the same viewpoint as you is a iSheep? Good thing you're not president. No but someone who complain about high prices for Microsoft and doesn't care about apple prices is an isheep. Period. $300 means little to me actually. But the point is that you have points of parity and points of difference. At the lower end the points of parity begin to fall for Microsoft as they missed the mark for pricing when they themselves chose to target the MacBook and say how much stronger their computer is. The points of differentiation only highlight themselves at the $1800 price and above; however the average consumer might not be willing to spend that high amount. And we can say "it's for working professionals" as much as we want, typically a working professional is supplied a machine that is determined by the bottom line and at $1,800; that's a hard sell. And those already in the Apple ecosystem have very little reason to jump ship as this does very little different than what they already have with a much more precise and better Wacom pen. But then again, I'm such an iSheep, posting from my Surface Pro 3. $2700!? I got a Gaming Notebook will better spec at a lower price point. Anyway, there are people that could buy anything at any price definitely not for the penny pincher. Too bad i don't belong to that group. "And we can say "it's for working professionals" as much as we want, typically a working professional is supplied a machine that is determined by the bottom line and at $1,800" So I guess those are the only working professionals? Not all working professionals work in an office. Not all working professionals, have to deal with Enterprise budgets. In fact, there are more working professional outside the Enterprise, than inside. People who are self-employed who normally buy Macs, would consider this. They are all professionals that dont deal with Enterprise budgets. Also, when you are at the top of the Enterprise budgets, namely a high ranking officer in a company, they may want this just for looks and status. Enterprise budgets dont apply to them. After all, when you are a CEO/President, you have whatever the hell you want. This laptop may or may not be for your "average working professional", which is a more distinct group vs a vague "working professionals" definition. Also, many companies still allow you to buy your own. So for example, if I bought this laptop as a Professional where I work, I simply bring it in to my IT staff and have it configured for me to use at work. What we do here is configure such with a second account for the domain, while keeping the default account for the original user who it belongs too. We install all of our software and we put our Enterprise version of Norton Security on it. What I am trying to show you, there is no longer some defined level of who a working professional is. I would say, its better to say, professionals that work in an Enterprise environment where cost is an issue, likely wont be getting a top of the line Surface Book or Surface Pro 4. But they could still get an entry model which is still cheap enough compared to what laptops many of them use. Crap screen lololololol. Retina screen on the MBPr blows everything out of the water. Macbook Pro 15 retina (2015) 86% sRGB Surface Pro 3 (2014) ~96% sRGB The only things it blows out of the water are low end budget sub $1000 laptops. Yet it's supposed to be priced at $2000+ LOL Not even useful for photoshop/cameraRAW, the only 'pro' thing you could do is look at 8bit Facebook photos maybe. Even screens with the same or higher resolution? If you type like a retard I am not going to answer you. I barely understand what you trying to say. The specs on paper are KTS! only the surface pro 4 has the 1tb option check out the page.http://www.microsoftstore.com/store/msusa/en_US/pdp/productID.325716000?icid=en_US_SurfaceBk_cat_modD_100615 alternately you can check out the mac page and compare. then use you money and buy whichever you please.http://www.apple.com/shop/buy-mac/macbook-pro if it is any consolation, the macbook pro is cheaper. I would pick a Macbook Pro. In fact Macbook price are quite competitive with the rest of the PC Notebook market. Furthermore, its unbeatable if you use VMWARE, Parallel or Virtual Box to integrate Windows into MacOS X. Mac also has very good music and graphic development tools not available in the Windows plus the ability to use Xcode for iOS development. Even Android development is pretty sweet on a Mac. Surface Pro 2015 series is pretty cool just not worth Microsoft asking price. No not really, for the price of a gimped Macbook Pro 13 which is really a reskinned ultrabook you can get a much more powerful laptop from Asus etc with a real CPU quadcore. As for music tools, Mac OSX can't even do native DSD codec. Good for people that can actually afford something like this. I was quite sold on this until I saw that it wobbles video. The Acer S7 is still the sturdiest hinge. Which is a shame since they nailed everything else. I wonder ifvthe Surface 4 is able to squeeze an i5 in it. Then that would be the ultimate tablet.